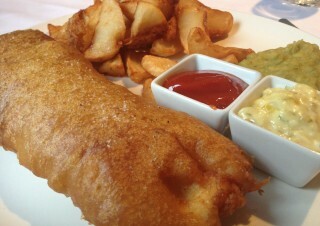 WEEKLY LUNCH PICK: The Courtyard Restaurant serves up fish and chips. Who knew? Here’s the question for all you competent cooks out there: hands up which of you makes fish and chips at home? Exactly. Of course you don’t. It’s dangerous work, messy to clean up if executed stovetop, and a pain to push aside the fondue sets and pasta machine to haul out the deep fat fryer from the back of the lowest cupboard. Much more sensible to go out. And many do: every faithful Friday to the local pub or fish market café for a basket of fish and chips (in my case, the Whalesbone Sammich is often the fish of choice). But who thinks to head to The Courtyard Restaurant when craving a chipper? Not I. Until last Friday. But newish executive chef Murray Wilson is a Brit, you see — he took over the top toque job when Michael Hay moved to Back Lane Café — and alongside his lunch menu of mostly posh things like wild mushroom risotto with truffle oil and pan seared steelhead trout bathed in beurre blanc, there is the entry “English fish ‘n chips”. Other than the fact it costs $16, it is properly old school.